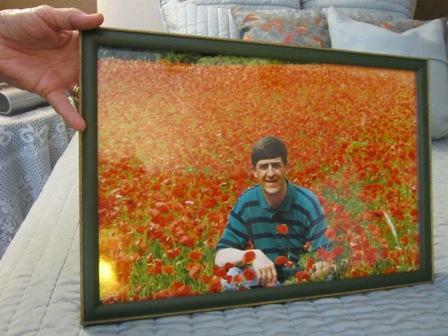 Ann Deveny holds a photo of her husband Dan, an impromptu shot in a German poppy field. Dan now suffers from early-onset Alzheimer's. Perhaps the most devastating fact of all is that there is no known cure. For the third part of our series The Golden Years: Aging in Our Region, WHQR’s Michelle Bliss talks to one Hampstead family learning to cope with their loved one’s early-onset Alzheimer’s. There are 200,000 Americans living with early-onset Alzheimer’s. Ann Deveny’s husband of 46 years, Dan Deveny, is one of them. Dan was an Army chaplain and the couple moved 34 times before settling in North Carolina. Ann clutches the framed photo of her husband. In the impromptu shot, Dan is wrapped in a blanket of red flowers. Like a weed, Alzheimer’s disease creeps up on us. By the time someone is diagnosed, they’ve probably been suffering—and losing brain function—for years. Dan was diagnosed in 2006 in his late 50s, but Ann noticed changes in his behavior several years earlier. Dan now lives in a personal care unit at Brightmore of Wilmington where she visits at least every other day. Ann used to think that she would die shortly after Dan, but now she’s looking ahead to a much longer life. And she’s found ways to maintain her composure. She no longer cries at his bedside. Instead, she reads to her husband, the former preacher, passages of scripture from their weathered devotional. Back when Dan was still at home, Ann provided full-time care, helping him dress, bathe, eat, and toilet. After several sleepless nights, she called the Wilmington branch of Home and Stead Senior Care for help. A team of professional caregivers rushed over, including Alzheimer’s Administrator Ann LaReau. Last year, more than 15 million family members and friends across the US provided more than 17 billion unpaid hours of care for a loved one with Alzheimer’s or another dementia. With no cure in sight, LaReau says advocates need to expand their awareness campaign to the scale of what we’ve seen with heart disease and breast cancer. Increasing awareness will be one step forward, but it’s not enough. During a recent campaign stop in Wilmington ahead of the May 8th primary, Newt Gingrich said that one of the largest cost-savings the country could adopt, in order to balance the federal budget, would be a brain science initiative designed to have breakthroughs in Alzheimer’s, Parkinson’s, autism, traumatic brain injuries, and mental health disorders like bipolar and schizophrenia. Gingrich said that we’ve done it before and we can do it again. Alzheimer’s research has not been a major platform plank of this year’s presidential primary, but the issue is slowly making its way to a national forum. On the local level, caregivers like Ann Deveny are gathering for support group meetings across the country, offering what they’ve learned to help someone else. When Ann isn’t visiting her husband or attending a support group meeting, she’s volunteering, studying the Bible with her small group at church, and going to lunch with friends. She says she’s in the process of getting her own life back—it’s all in progress.